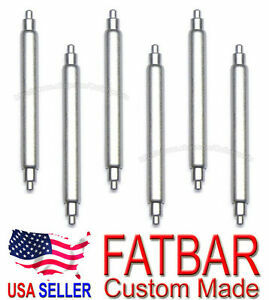 19mm 20mm 22mm FATBAR 2.5mm FAT Spring Bar Pin for Seiko 6105 6309 7002 SKX007 & Monster SKX779 781 Diver Watch fits Z20 Z22 Rubber Watch Bands. This is the best heavy duty FAT spring bars for your Japanese diver watch. Er zijn 214 objecten beschikbaar. Voer een getal in dat minder is dan of gelijk is aan 214. According to eBay policy, we now only accept payment via Paypal. If any of our auction or buy it now is not what we have listed or different from our listing, we will refund your purchase price. Your satisfaction is our first concern. Thank you for your business.